Special price for BLACK FRIDAY!! Supports up to 64G! AGPTEK A16ST 16GB MP3 Player adopts the new Bluetooth 4.0 wireless transmission technology, which provides a faster and more stable data transmission. A perfect partner for running, jogging, riding, hiking etc. Supports up to 128GB Micro SD card (not included). 2-in-1: It is not only a mp3 player, can also be a FM radio.Because the mp3 player supports FM radio under bluetooth mode. ( plug an earphone as an antenna ). AGPTEK A05ST 16GB MP3 Player adopts the new Bluetooth 4.0 wireless transmission technology, which provides a faster and more stable data transmission. A perfect partner for running, jogging, riding, hiking etc. Capacity: 8 GB; supports up to 64 GB (SD card not included). Support FM Radio, voice recording and E-book reading (support txt format only). HiFi-class High Resolution Digital Audio Player. Support multiple music formats: MP3/WMA/FLAC/APE/WAV/OGG and etc. MP3 player, USB cable, user's manual. Shock absorption surface and it only weights 1.1 oz. Smart but Big Music. Go into settings, play mode, and then Shuffle. Automatically scan and save your FM channels. BREAKTHROUGH UPGRADE: one key to lock/unlock screen. also designed with Independent Volume Control, Give you a more user-friendly experience .You can Switch songs or adjust the vol by our IN-Line control earphone, with 1.1 oz mini size body, Perfect for your outdoor and gym fitness. 70 HOURS PLAY AND MORE: 70 hours audio playback, only need to charge it for 3-4 hours. You can charge it in computer or with the general charger which output is "5V, 0.5-1A" EASY TO USE: Just drag and drop the music file or folder directly when connecting to computer, Shuffle favorite songs in any folder or playlist which you selected, Simply Sync playlists by Media Go(for free) on your computer,Works perfectly with Car via AUX port. (Additional male to male AUX cable is needed) HiFi-CLASS BIG SOUND. Item has been tested and works perfectly. BORN FOR PROFESSIONAL. Sound guaranteed with the professional HIFI sound quality, with WM8740 DAC chip which increases the Voltage Amplifier. EASY TO OPERATE. Metal body with independent knob volume control make the listening and operation as easy as the way you like music. HD OLED SCREEN. 1.3-inch OLED screen comes with high contrast which make every word can be clearly seen even under great light. LONG BATTERY LIFE. 1500 Ma battery with low power consumption provide you with 12 hours using time at least. Fast charge and longtime use never make your music journey pause. RUN SMOOTHLY WITH MOST FORAMT. Support high resolution lossless Music files format: APE(48K/24bit),FLAC(48K/24bit),WAV(96K/24bit),WMA(48K/16bit). Best gift for your friends!! Supports up to 64G! Bluetooth function makes you free from worry about tangle cables. 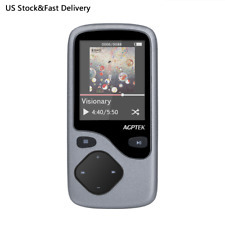 1 x AGPTEK A01T MP3 Player. HIFI Lossless Sound Quality The music player has 8GB internal storage and can be expanded to 128GB with a TF card slot built-in. BLUETOOTH CAPABILITY: Great Bluetooth enjoyment with your BT device (Bluetooth 3.0 or above). You can also connect it with your car of 0000 PIN code via bluetooth (not with random PIN). LOSSLESS MUSIC PLAYING: Provide great quality sound for the array of music and convenient to download (Support MP3, APE, and FLAC WMA etc.) And you can add bookmark for your music files (including audio book it supports). Storage:It comes with 8 GB capacity (supports up to 64GB with Micro SD Card, not included), which allows you to enjoy music up to 4000. There is no limit to the number of songs if you read through the folder. LONG PLAYBACK TIME: The built in 180mAh rechargeable battery takes 2.5 hours of full charge for 12 hours playback with wired earphones. 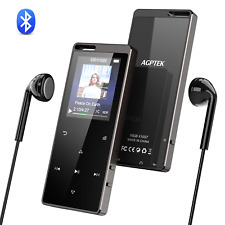 Agptek A02 Music Playback If Up To 70 Hours Of Lossless Sound Mp3 Player (Capacity 8Gb) (Black). 8Gb, It Is Possible To Put The 2000 Songs. Micro Sd Card Support To 64Gb. Lossless Sound Quality. Correspondence Can File Formats: Mp3 (Mp1 Mp2 Mp3) Wma Ogg Wav Ape Flac Aac-Lc Acelp. Lossless music playing. Provide great quality sound for the array of music and convenient to download (Support MP3, APE, and FLAC WMA etc.) And you can add bookmark for your music files (including audio book it supports) Great Bluetooth enjoyment with your BT device (Bluetooth 3.0 or above). You can also connect it with your car of 0000 PIN code (not with random PIN). 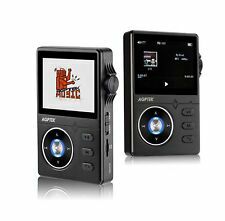 AGPTEK 8GB MP3 Player with FM/Radio Record Metal Body Music Player, A29 Black. Shipped with USPS First Class Package. AGPTEK A16ST 16GB MP3 Player adopts the new Bluetooth 4.0 wireless transmission technology, which provides a faster and more stable data transmission. A perfect partner for running, jogging, riding, hiking etc. - Touch button with 1.8”Color TFT screen: Easy to operate the multi-function player via 9 sensitive and quiet touch buttons.With key backlight you can easily access to the music world at night. Solar Powered: Non-stop music enjoying during the outdoor activity. The MP3 player adopts monocrystalline silicon solar panel. You can charge it while listening to music under the sun. Energy-saving and environment-friendly. Lossless Stereo Sound: Audio format supported MP3/WMA/APE/FLAC/WAV. It adopts professional intelligent digital noise reduction chip to reduce noise, ensuring high sound sampling rate and providing Hi-fi class sound that is close to the original. 2000 SONGS AND MORE: 8 GB capacity and expandable up to 128GB Micro SD Card( not included), which allows you enjoying music up to 4000. There is no limit to the number of songs if you read through the folder. LONG BATTERY LIFE & FAST CHARGE: 60 hours of playback time with wired earphone. Only need to charge for 2 hours. AGPTEK 16GB MP3 Player with Bluetooth 4.0, Portable Lossless Music Player Supports FM Radio Voice Recording, Expandable Up to 128GB, Black(C5M). LOSSLESS MUSIC PLAYING: Provide great quality sound for the array of music and convenient to download (Support MP3/WM /OG /APE/FLAC/WAV/AAC-LC/ACELP). IPX8 Waterproof: The MP3 player and earphones meet IPX8 waterproof standards, comes with bonus swimming goggles. Ideal for swimming, surfing or other water sports. High Quality Sound: Supports MP3/WMA/WAV audio formats. Built-in 8GB memory with shuffle feature, enjoying up to 2000 songs. 360°Degree Rotating Clip: Avoid falling out when exercising, you can enjoy your music without interruption. Coiled Earphone Cords: Convenient use without any tangle. There sizes(S/M/L) of eartips for swimming and one for general give you a good fit. Certification: CE, ROHS, REACH. More reliable with 1 year warranty. 4-6 hours of playback time at medium volume. Born for Sports:Whether on the beach or on dusty mountain trails, dirt or dust will not stand a chance of infiltrating the sport MP3 player. It is dust and water resistant to IPX4, so you can always make the best of its performance. Fully enjoy your sports in music with your hands free. Lossless Sound Quality:Supports music formats such as MP3 / WMA / OGG / APE / FLAC / WAV. Gentle bass effect gives you a better music holiday. Flexible Headphones Design:The mp3 player is universally sized bendable. Wrap-around style earphone are made to fit flexibly for your active lifestyle and slide on in seconds. Shuffle Function:Supports sequential play, random play and single-loop play mode. 8GB memory makes more music collection available. Battery Life:About 12 hours at medium volume. We receive most of our products from liquidators. New products are ones that have never been used and never been opened before. The item will be just like new. For Parts or Not Working. Open Box/New Other. 8GB Built-in High Capacity, Support up to 64GB Micro SD Card. Easy mode for Sport and Driving. Design for Sports and driving. Portable Voice Recorder with Noise cancelling. Shock absorption surface and it only weights 1.1 oz. SIMPLE OPREATION: Independent volume keys and switch keys, 0.96 inch OLED, Bright user panel and Easy Navigation, one key to lock/unlock screen. METAL MATERIAL AND UNIQUE PROESS: High quality metal body makes it strong and beautiful,high strength/shocking and crushing resistance. HiFi-CLASS BIG SOUND: Loss-less Sound quality.,Support Most Popular Audio format: MP3, WMA, OGG, APE(Normal/Fast),FLAC, WAV, AAC-LC, ACELP MULTI- FUNCTION &LARGE MEMORY:8GB Internal Capacity for up to 2000 songs, supports up to 64 GB Micro SD Card! (To avoid incompatibility, please use AGPTek Memory Card).JUST ONE ORDER for:music, FM radio, File browser, recording, Ebook function. AMAZING VALUE PACKAGE : also include: black HD headphone and Adjustable Sport Running Jogging Armband,you can do any exercise you want. AGPTEK Clip MP3 Player 8GB Mini Digital Music Player for Jogging Running Gym, Supports up to 128GB, Black(R3). LOSSLESS SOUND QUALITY: Support audio formats: MP3/WMA/OGG/APE/FLAC/WAV/AAC-LC/ACELP. Enjoy high sound quality. Shuffle with Bluetooth 4.1 CSR, Compatible with most Bluetooth output device, support playlist under Bluetooth status, enjoy your high-fidelity stereo music with your wireless earphone. Opened to inspect the content only. MCU DAC for Lossless Music: Featuring SNR: ≥99dB, the player adopts MCU master chip and DAC audio converter to reduce sound distortion. Support Lossless format like Native DSD64/128/156, APE, FLAC, WAV, and other popular format like MP3, WMA, OGG, AAC-LC, ACELP, etc. AGPTEK A02 8GB MP3 Player, 70 Hours Playback Lossless Sound Music Player (Supports up to 128GB), Dark Blue. Supports MP3, WMA, Flac, Ape; Lossless BIG Sound.Special Design Armband Available, Search "AGPTek A02 Armband ".